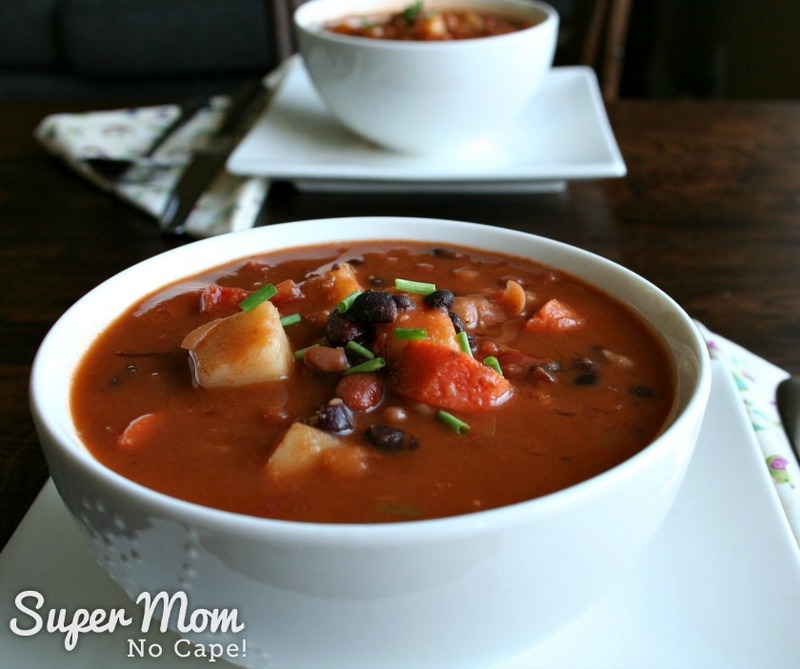 Are you looking for a good, hearty soup to feed your family for supper? 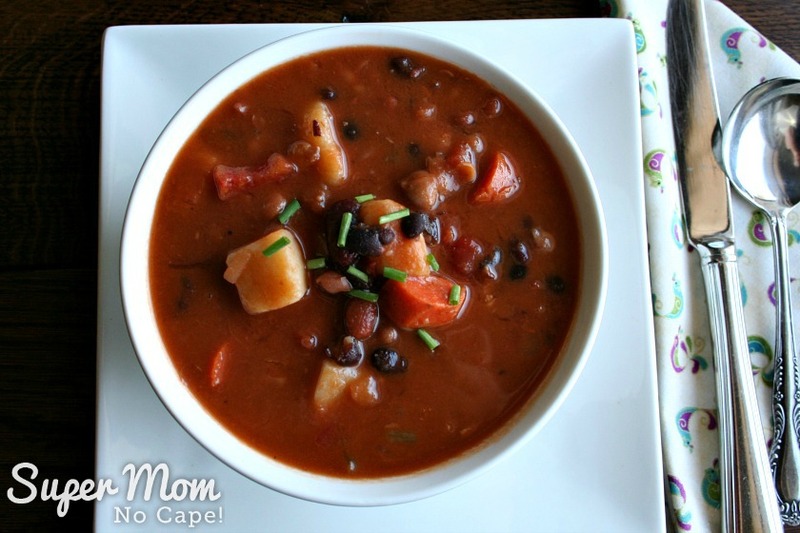 One of our family’s all time favorite soups is homemade bean soup. It’s a delicious, stick to your ribs soup that will have everyone going back for seconds. And I always have a jar of the mixed dried beans on hand to make it with. 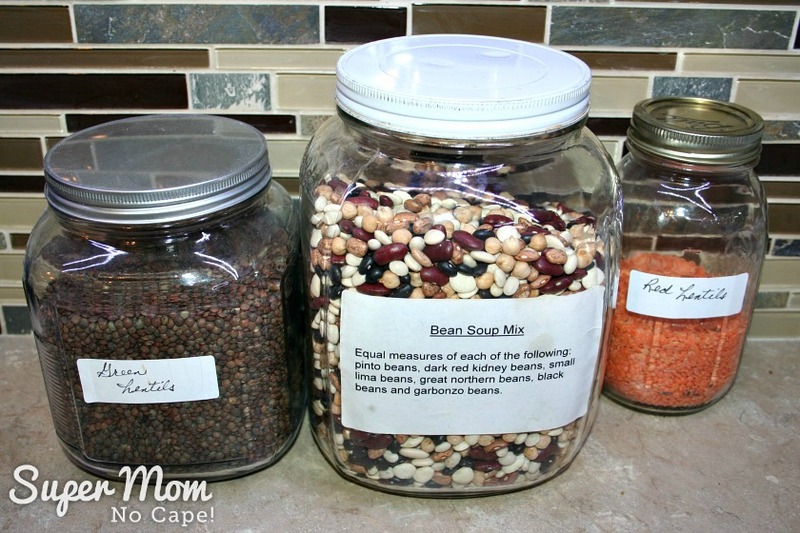 You can find the recipe for the dried mix I make in my Bean Soup in a Jar post. The mix is also a quick, inexpensive gift to give to friends, neighbors and teachers. In the post, I show you how I dress it up for gifting. First, you’re going to want to soak or partially rehydrate the dried beans. Now I know there are those out there who say that you don’t have to soak them but in my experience soaking the beans before cooking decreases the cooking time significantly while at the same time enhancing the flavor. 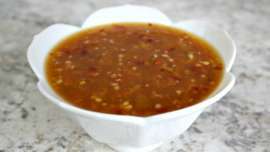 Place 2 cups of the dried bean soup mix into a large bowl, add enough water so that they are covered by at least 2 inches of water and soak overnight. The next morning, drain the soaked beans and place them in a large 8 quart stock pot. Place 2 cups of dried beans in a large pot, cover with water and bring to a boil, turn the heat off and allow the beans to sit in the hot water for 2 hours. Or if you have a pressure cooker, you can add the dried beans to the pressure cooker, cover with at least 2 inches of water. Secure the lid on the pot. Heat until the rocker is rocking gently, then cook for 20 minutes. Move the pot to the sink and allow a stream of water from the tap to flow onto the lid. When the pressure vent goes down, it is safe to open the pressure cooker. I prefer the pressure cooker method because I like the flavor that cooking the beans with the ham bone under pressure adds to the finished soup. 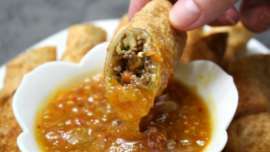 After the beans have been cooked in the pressure cooker, remove the ham bone and add the coarsely chopped onion, chopped celery and diced tomatoes. Add water until the pot is almost full. Place the pot on the stove with the burner set to high and bring to a gentle boil. 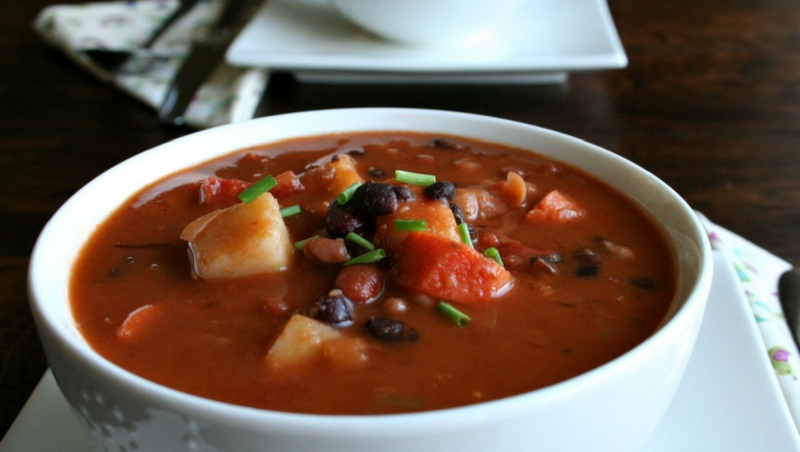 Reduce the heat to low and allow the soup to simmer until the beans are tender. This will take at least an hour. The beans will absorbs quite a bit of liquid and some will cook off, so you may find that you need to add more water during the cooking process. Don’t add too much though because the more you add, the more you will dilute the wonderful flavours that will have developed. About 15 to 20 minutes before you’re ready to serve the soup, add the diced potatoes and sliced carrots. When the potatoes and carrots are tender, the soup is ready to eat. 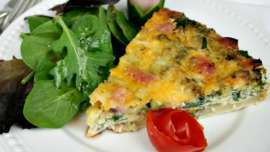 This recipe makes approximately 10 to 12 large servings. 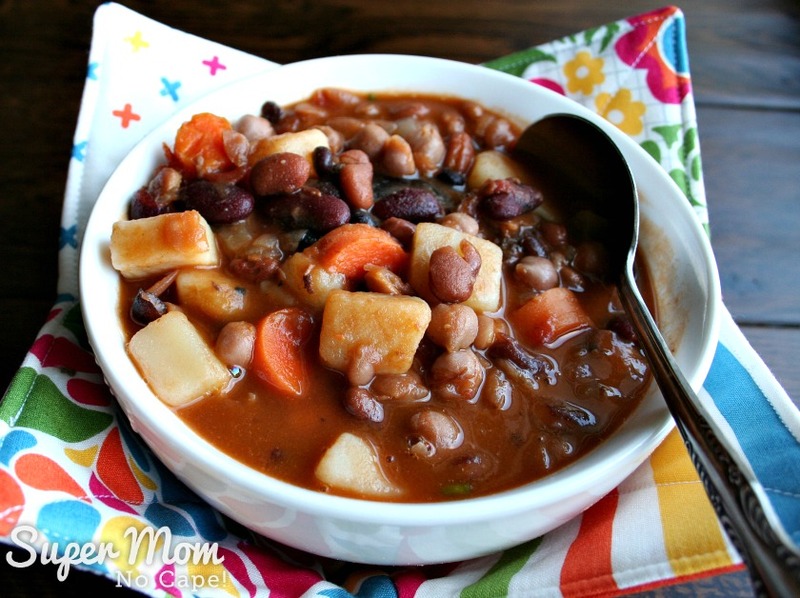 As with most soups and stews, this Homemade Bean Soup is even better the next day! Reheat in a pot (my preferred method) or the microwave. Ladle into a bowl, place the bowl in a soup bowl cozy and dig in to another delicious serving of soup. Save this recipe for future reference by clicking on the Pinterest button underneath this post. Note: This post originally appeared on Super Mom – No Cape in June 2013. It has been completely updated with new photos, text and a video. Oh, that’s yummy! I love bean soup, and I don’t even care what beans are used, it’s always good. The idea of adding the carrots is great. I’ll do it! Thanks for a great recipe. I love meals in a jar – this could actually be a quick one if instant beans were used. Thrive makes red, black and pinto instants. Wouldn’t be the same, but it would be 30 minutes or less. =) I’m making a .pdf from your post so I have this with my shopping list. Soup recipies are always useful, aren’t they! mmmm – now I’m hungry!!! 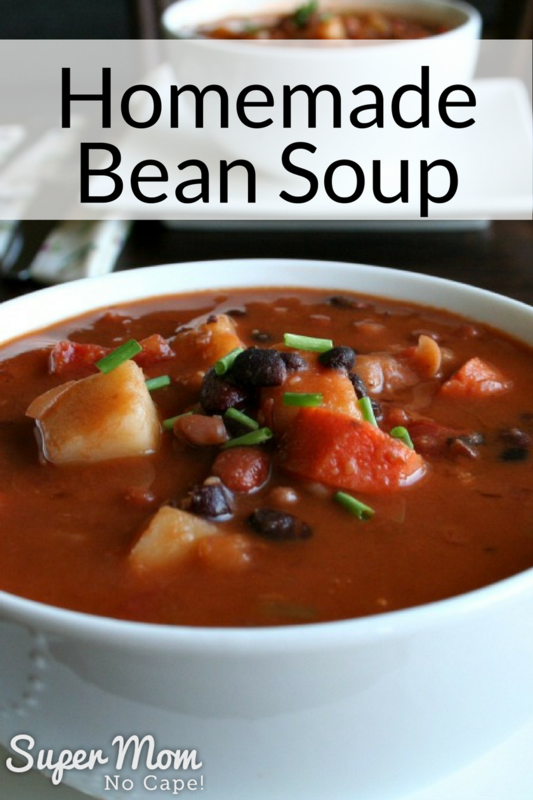 Bean soup is a favourite here too – even better that it’s a cheap meal (usually more than one! ).